Asian School of Business / News & Events / Campus Updates / AEG ASB Inter-College Sports Meet, ATHLEEMA 2019 Witnesses some Jaw-dropping matches in Football! 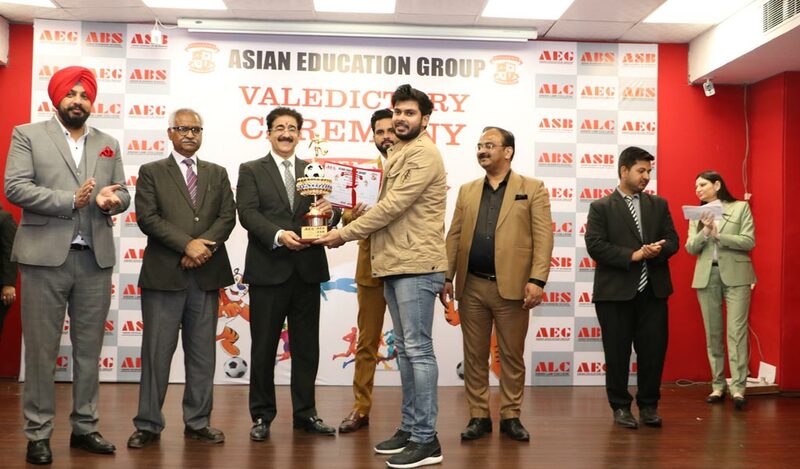 Asian Education Group (AEG) recently held its much sought-after mega annual inter-college sports event – ATHLEEMA 2019-Season 7 – from 13th to 15th March 2019 at the sprawling Jasola Sports Complex, New Delhi with its traditional punch of excitement and grandeur. In all, 36 top colleges of the metropolitan capital city enthusiastically participated in this sports spectacle. This included Asian School of Business (ASB) and the other two constituent group colleges of Asian Education Group – namely, Asian Business School (ABS) & Asian Law College (ALC) – which actively participated in this high-pitch sports’ meet. Of the several games in which competition was held, one was the most exciting game of Football. ATHLEEMA 2019 witnessed some nail-biting matches in Football! The total number of teams which participated in the tournament were eleven, which included well-known institutions like Sharda University, Amity University, Gautam Buddha University, Dyal Singh College, IIMT Greater Noida, AAFT, PGDAV and others. The tournament consisted of 10 knockout matches. After a series of edgy and tough quarter-final matches, Gautam Budha University, Amity University, PGDAV, and Sharda University finally appeared as semi-finalists. The first semi-final match was held between Gautam Budha University and Amity University. Both teams played very well and tried to give their best efforts. Finally, Amity University progressed to Finals winning the match by 1-0. The second semi-final took place between PGDAV and Sharda University. Both teams gave a tough fight to each other to take their way into the finals. It felt as if the match might end in a draw leading to penalty shootouts, but then a goal during last minutes of the match took Sharda University into the finals. The final match took place between Sharda University and Amity University. Full of grit, determination and defiance, Sharda University beat Amity University to win the tournament with the help of a goal in last minutes of the match. Delly from Sharda University scored the maximum number of goals in the tournament and won the ‘Golden Boot Trophy’.